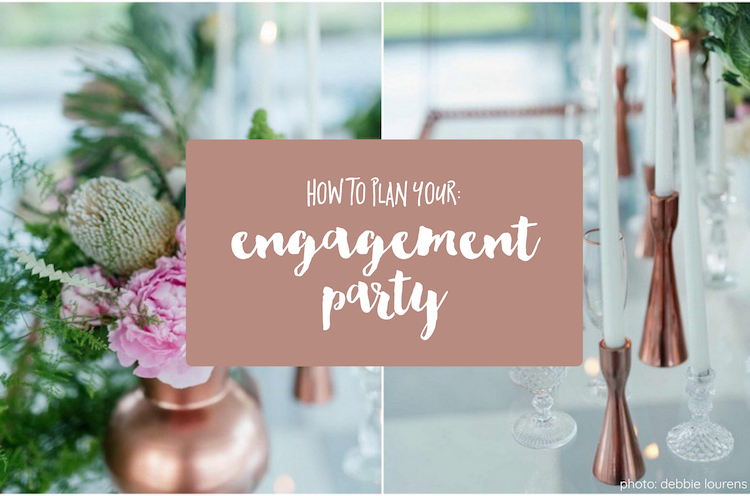 How To Plan Your Engagement Party in 5 Easy Steps! You’re engaged have decided to celebrate, which probably means you’re wondering how to plan your engagement party. To get you started on the first celebration of your wedding planning journey we have gathered some guidance on what to do before, during and after you plan your engagement party. By now, you would have already broken down your wedding budget and decided on your wedding guest list and are in good shape. But, before you rush to start planning your engagement party, stop and spare a thought for how you are going to tell every one that you’re engaged. Check out our advice and fun ideas for announcing your engagement here. 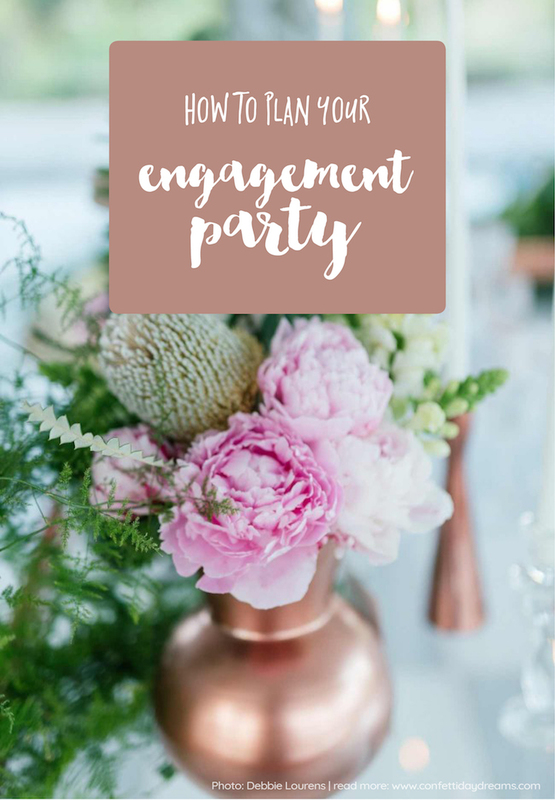 Not only is your engagement party an opportunity for your closest loved ones to congratulate you, but an engagement party is also a chance for everyone to meet in one place, get to know one another. In the past, engagement parties were hosted by the bride-to-be’s parents. Nowadays, you have the freedom to be more flexible and plan your engagement party your own way. So, if you like, your engagement party can be hosted by both sets of in-laws, family, friends or by your own selves! Here’s how we’d go about it. Usually, your engagement party is held two to four months after the proposal, when the news is still fresh. When setting a date, think about how long it will take you to plan your engagement party, when it will be financially affordable to throw the party, and when the majority of the invited guests will be available to attend. If there are some people you just can’t do without, maybe chat to them first about date conflicts so that you can plan accordingly. Do NOT do this for everyone though, or you run the risk of your lives turning into a nightmare trying to accommodate everyone on your guest list! As an engagement party is generally a more intimate affair than your wedding, you would normally only invite your immediate loved ones. Keep in mind that guests invited to the engagement party will almost certainly expect to be invited to your wedding – so don’t go overboard. Start with a draft wedding guest list and then trim it down to your immediate family, friends and potential bridal party. This will give you a good idea of what your engagement party guest list might look like. If you’re hosting at (your own or someone else’s) home, you’re good to go! If you plan to celebrate your engagement someplace else, like your local tapas bar, or with a picnic at a botanical garden, make sure you confirm your booking before inviting your guests. Remember, this is not your wedding, so a three-course meal with floral chandeliers and live entertainment is not required. Usually a few beverages, cocktail-style eats (or a barbecue) and awesome company will do. While gifts are not normally expected for an engagement party, some guests might not know if they’re mean to arrive with a gift. Remember that wedding celebrations can become gift-burdensome for guests who could be invited to a couple of pre-wedding parties ranging from your engagement party to your bachelor / bachelorette parties, wedding showers and, of course, the wedding day itself. If you’re not expecting gifts, make sure you to let your guests know. And, whatever you do, don’t ever put gift registry info on an invitation. Use word of mouth, parents / BFF’s or, later in the process, a wedding website to help spread the word about a registry. We love the idea of forgoing gifts, but offer guests the option of donating to your fave non-profit instead. Don’t stress if you haven’t figured out your wedding colors or date. Your engagement party invitations don’t have to match the rest of your wedding stationery, and your wedding Save The Dates will inform your peeps about the rest of your wedding details, later. Sending out your engagement party invitations can be done in a variety of different ways. Perhaps your parents and older folk might prefer an invitation posted or hand delivered to them. Other, more tech inclined guests will likely do just fine with an online or digital invite via email / text. Digital invites are more affordable, quicker to send out, and much kinder to the environment – check out sites like Greenvelope or Appy Couple for the digital route, or have a look at these 22 engagement party invites – including digital, DIY and home printable options! Keep a spread sheet of any gifts received or donations made, as well as a list of who helped where. This will allow you to happily send out thank-you message straight away. While formal thank you cards are an option, you don’t HAVE to go all out, especially of your engagement party had a more relaxed vibe. A hand-written thank-you note, phone call or personal text / email message saying thanks is also acceptable. And, if you didn’t host the party yourself, a small gift to thank your hosts or to those who helped out more than others, is a great idea. Read these 18 Tips for spectacular engagement photographs and get loads of gorgeous photo ideas for your engagement photoshoot.